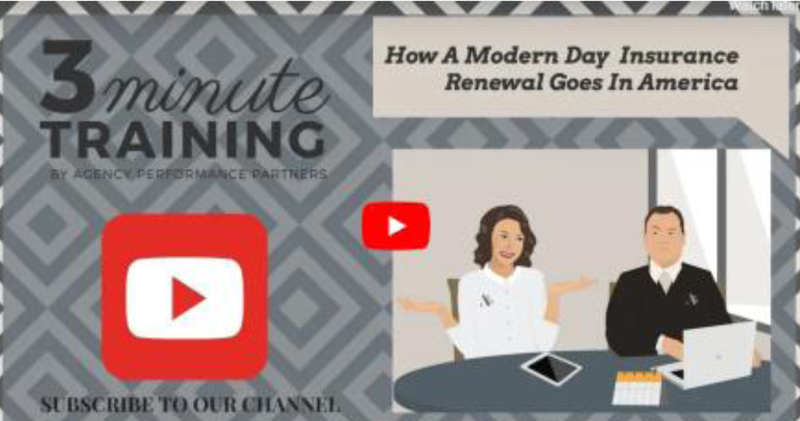 So let’s chat a little bit about how a modern day renewal goes in an agency. So let’s just imagine and paint a picture. Let’s paint a picture of Sally and Jim. Sally is a nurse and let’s just say that Jim is veterinarian, right? So they both have a long day at work, they have a great family at home. Sally comes home from her long day of being a nurse, on her feet all day, she gets in the door and is greeted by her great kids. And the first kid is coming and saying, “Mommy! I want to go to soccer camp! It’s only twenty five hundred dollars!” and Sally’s like, “Great! How are we going to get that money?” She goes to mailbox, grabs the mail and in the mail is her insurance renewal. Now, she opens it up and what do you think has happened to it? It’s gone up, right? And right next to it is her credit card bill from Christmas that hasn’t been paid off yet and her son with crocodile eyes saying, “I wanna go to soccer camp!” She immediately puts the mail aside, says she’ll deal with it tomorrow and goes about making dinner. Now her husband comes home from a long day, maybe a nighttime meeting and he’s hangry. So he’s looking at the mail saying, “What the heck!? Jim in my office pays X and Bob pays Y and our cousin pays X! We are absolutely getting taken advantage of!” And all of a sudden you’re thinking to yourself, “Oh, we’ve got to take a look at this.” We’ve got all these bills and everything is going up and no one really wants to pay for insurance. Put it aside and say I’ll call in the morning. Now everyone sits down and watches some TV, maybe they’re watching The Voice. Great show, by the way, and all of a sudden what do you see every commercial break? Geico, State Farm, Progressive. All the direct writers out there basically saying go online, go online, go online. And we never have our phone, iPad or laptop more than six inches from us while we’re watching TV, right? They hop online, get a quote and what do they get? First of all, they can quote themselves at the lowest limit; saving them money. Second of all, they get a quote less than what they have currently with you and now they are spicy. Immediately when they submit they could call and buy new coverage at 11 o’clock at night. They’re going to get text messages, emails, phone calls from a sales team that wants to win that person’s business. Now, you’re closed, so by the grace of God in the morning they call and they are spicy. “What is going on? Our rates keep going up! I need to shop my insurance!” Now you go ahead and shop their insurance, but you get back to them four days later. In those four days they’ve received countless phone calls, emails, text messages from whoever they got quotes from and they may have even already selected a new carrier. That remarket you did could have just been in vain and then a waste of time because they’re not going to call you back. We need to embrace the modern renewal strategy in America especially for personal lines. Your competition is fierce and operating when people are actively looking for insurance. When someone calls into your agency looking to be remarketed it has to be the hottest priority, just like a new lead, because you don’t have a lot of time to work. The other thing is we really should be getting to people before that spicy phone call comes in. Get on those renewal calls. It’s key. Also understand and start analyzing how long, how quick your turnaround time is on a remarket. You may be shocked and that may be the biggest issue of why you’re losing some customers.